It’s early morning, and I’m engaging, as lovingly and patiently as I’m able to, with my Money-Orphan. Who is a Money-Orphan? A Money-Orphan, in the Fertile Heart world, is a part of me—and possibly a part of you– that relates to Money in a way that creates suffering. For you, your loved ones, and consequently for the larger human community. As many of you know, part of the Fertile Heart ™ Ovum Practice is articulating each day what it is that is asked to be birthed through you. Although I’ve known for years, that the Money Orphan has been in charge of my finances, I couldn’t quite gather the courage to poke my head through the door of the orphanage and call her name. Then some months ago, as I began doing the math for printing t-shirts and launching a new website dedicated solely to the peace efforts, my next birthing assignment was clearly to make some sense of my money-related beliefs. So, I took a deep breath, and said it. Outloud. I’m birthing a healthier relationship with Money. .
As the adage goes, Be careful what you wish for! Or rather in the O-V-U-M world, be careful what you set out to birth. Once the gestation begins, you don’t have much say in what the next incoming-tide-of-creation brings in. And so a couple of weeks ago, the current pulled in a big old plastic technicolor toy to lure my Money Orphan out of hiding. On February 24, The View devoted an entire show (I’ve been told that this is not something they ordinarily do so you know there had to be a lot at stake) to one topic: Infertility. I don’t have a TV, but clients from around the country saw the show and sent a link to the entire online episode. And that’s how the producers of that View segment and every one of the people who participated in it became the perfect midwife for the next stage of my money-madness-birthing assignment. If I ever wanted proof of how badly the Fertile Heart™ philosophy of becoming our own authorities, is needed in the world of reproductive health, every second of that View episode offered such proof. A celebrity couple, the 35 year old Guiliana Rancic and her husband Bill, reporting mournfully that the chief problem with their failed medical treatments was – her age. Not that I blame her. It’s what she’s been told by the powers that be. Though I’d love to give her names and numbers of the many over-thirty-five new moms with healthy babies. Better yet, I’d love to sit down with her for a few minutes and see if we can conceive of a more interesting answer for her difficulties. And another couple, unofficially representing a national advocacy group, telling us how lucky they were that their insurance covered their first three failed IVF treatments. The wife shared that she has been struggling with endometriosis since young adulthood. I’m all for insurance. I really am. Still, looking at the beautiful young woman and her husband I couldn’t help but wonder what might’ve happened if IVF was not so readily available to them. I hope that now that she ran out of insurance coverage, she will turn to less costly, more compassionate approaches to healing her endometriosis and getting pregnant. Toward the end of the show, our reward to sticking it out, was a success story. The backdrop displayed a oversize photograph of a little boy. Minutes earlier, we listened to his self-deprecating dad as he bemoaned his substandard sperm: “I tried vitamins and herbs to improve the quality,”he said, “but it didn’t work.” Vitamins and herbs. Well, what else could he have done but moved right into IVF after that fully holistic attempt to heal himself? Since the vitamins and herbs didn’t work, the wife endured several years of treatment to conceive the smiling little boy. My hope is that the dad will be inspired to seek a more creative path toward repairing his sperm-related ailments. And I trust that the sweet little boy in that photograph will not have to suffer any consequences of the treatment. But wouldn’t it be great if couples such as this one, would be encouraged to engage in a more meaningful exploration of treeatment options before moving on to a procedure with such potentially risky side effects? So how is this View episode such a gift for my own birthing process? No matter how badly I wish to fight it, the truth is that at this stage of our evolution, the human psyche carries a deep imprint of a Money Orphan that says: Money equals Value. The more you pay the more valuable the service must be. 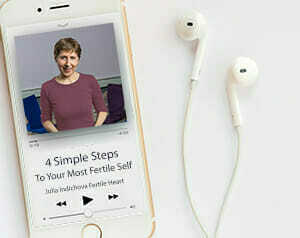 I’ve observed it for years with clients who, although they tell me how much the Fertile Heart™ tools make sense to them, will spend thousands of dollars on repeated failed medical treatment, before committing a tiny fraction of that cost to coming to a workshop or ongoing classes, or even buying a book or CD. If it costs $15, 000, it’s got to be more effective than the ideas in a CD that cost $18. This is not a conscious choice. It’s not something most of us have control over unless we begin to compassionately observe it in ourselves; observe how our credit card receipts mirror our beliefs. I watch that child agonize over registration fees, and see how she is still the awkward, frightened kindergartner who brought shiny calendar-cards to school, hoping to bribe her way into friendship, into feeling more acceptable. She is also a child raised in a society that viewed money as an instrument of evil. A child of parents who lived in lack as a way of paying for being alive. That child believes that if she is generous and self-sacrificing enough, someone powerful and grown up will speak up on her behalf. She believes she can make other people care about, what she perceives to be injustice. Now that I understand all that a little more deeply, I can begin to clear up her confusion. I can show her that there is no fertile money, no tainted money, and no clean money. At this stage of the evolution of our species, money is simply the currency of exchange. And an imperfect currency of power. Sadly, in the human society, it is right now certainly the Orphan that’s the Chief Financial Officer. In the world of Reproductive Health we’re selling out big time. Whether consciously or not so consciously, the experts of the field must know how much potential harm they’re causing. Very very few of them speak about it. After all, what will happen to their investments in all that state of the art technology, if we discover that we can get pregnant on our own? Surely it was the Orphan that produced that View episode. As for me, if I don’t begin to offer my work in a way that –reflects my own respect for this beautiful birthing practice, there is little hope that this healing modality will reach the many people who might find it useful. Another sobering realization is that I can’t buy anyone’s passion for the causes I care about with money or discounted fees. But I can continue to pass on what I’m learning about the wondrous adventure of following through on our longings; of discovering what is at the root of our desires. If we can support each other in that exploration, somewhere along the line we might discover that the causes we humans care about most, are the same. “I would like to donate some money to your cause. I am a success story and feel that this work is so important in empowering women to take their power back when it comes to their fertility. Please let me know where and whom to make the check out to. I don’t mind at all if you use my name. I would be honored. I will put my story to paper soon and send it along to you. Because I am renewing a beautiful and magical practice that I haven’t practiced for a very long time, I will be tithing monthly to your organization for a while. I have been pondering who to tithe to for about a month and then inspiration hit! Universe spoke and I took action. Thanks again and blessings to you and your beautiful work. I am about to hire a helper to design our new website focused on the OVUM approach to peace related activism and healthcare reform. Jamie’s contribution will go to a special account assigned solely for the new website expenses. Thank you, Jamie! How about you? Who’s in charge of your finances? Is it the O, the V, or the UM? Could birthing a healthier relationship with Money and Power be helpful for your baby making journey? I feel real compassion today for the orphan who smiled and nodded recently while my endicrinologist wrote out a referral letter for me to see his colleague who specializes in IVF. ‘If I please him and make him the expert, he will like me then I will get what I want’ she thought. Today, the Visionary in me wrote a letter to my endo and said that I would not be meeting with his very eminent colleague and that I would let him know when I have decided what course of action I want to take. To be fair, he was very interested in the OVUM work when I told him about it but I don’t think he could conceive of a process that wasn’t medically managed and certainly the implied view was that it wasn’t enough to get me a baby. Today, I am committing to making the OVUM process enough. PS I call my longed for baby ‘Violet’ even my family have started referring to Violet!! This lovely spring morning in London, I discovered wild violets growing in our garden. I have never seen them before. Perhaps a little signpost and it made me smile. This is just such an accurate description of the confused, scared orphan in me that’s been crying out for attention for several years—not so much in relation to money, but in some very difficult family relationships. As always, thank you for all that you do for me and the many people out there who have grown so much because of this work! Thank you for the very thought provoking blog Julia. I had to dust off some cobwebs to get to my money orphan. I have realized that how I currently view and spend money is very similar to my parents. Growing up I was fortunate(?) to have everything I wanted and more that money could buy. I remember that I never had one new dress for my birthday but five, and shoes in every color and style imaginable. That has translated today to a carelessness and disregard when it comes to spending money. The program on the view made me think of the many ivf and iui cycles I have undergone over the last 5years were all covered by insurance and I wonder when I would have stopped and how different things would be today if they were not covered. Would I have just done one or two ivf cycles or would I have kept going…if I had to pay them out of pocket..? I think I would have stopped a lot sooner without insurance. I have a pretty strong feeling that I would have a baby by now if I did not have insurance to cover all those ivf cycles and fertilty meds..how ironic. I feel that just the awareness of if the O, V or UM is making the decision to spend or not to spend can make a significant difference. Thanks for such a passionate blog Julia. Like you I am more passionate than ever to spread the word that there is another way. I always trusted that the way was not through the IVF or the drug route but there have been times when I wavered and doubted myself and when I slipped into a big gloomy trench – often facilitated by the fertility ‘experts’ in the medical profession. I very almost paid out for surgery privately which is a big deal when its available free with a relatively short wait here in the UK, but I didn’t want my ‘no-money orphan’ to be in charge of such a decision… Happily some heart felt discussion and consideration with my husband, some visualization and a new found impetus to follow my own intuition and be my own authority brought me to the decision to wait. Just as well because that latest negative diagnosis of fibroids (I thought endometriosis had been the only problem) took me to Julia’s fibroid free exercise. This turned out to be an exercise so potent that it shook me physically and had my body speak to me in words I did not understand but that when I looked them up main perfect incredible sense. My intuition also took me to a homeopath. These were the final pieces of a 2.5 year jigsaw and incredible journey. As I type I am 11 weeks pregnant, it happened while I was finishing the last day or 2 of the fibroid free exercise after 2 weeks of practice. Thank you so much Julia for the hope and possibility you are spreading. It does work! And it also shakes so many skeletons out your cupboard that you cannot help but be lighter, wiser and happier along the way, even given the troughs – perhaps inevitable given how heartfelt this journey is for us all. I know myself a lot better than had I got pregnant first time I tried 2.5 years ago and for that I am very grateful. I wouldn’t change a thing, I have learnt so much. Thank you so much for this post and for the brave, passionate, and insightful comments! Such a timely subject for me as my money-orphans busily avoid anything to do with taxes. I welcome the gift of this blog with my UM and Visionary even as my orphans protest, run for cover, shake, and whine. I am reminded of a conversation I had with my own mother after my brother was born. I was curiuos about the birthing process but I desperately wanted reassurance that, if I had a child some day, I could be “put to sleep” during the process so that I would not have to experience any pain. For me, the prospect of paying for high-tech intervention – although extraordinarily painful, arduous, and potentially heart-breaking – was the equivalent of some sort of anesthesia. Close my eyes, hand over my power, don’t think about my wallet, and let me be delivered. In fact, I have endured 6 miscarriages while squeezing shut my eyes to true healing. Even now, my orphans are screaming for “quick” fixes and sedatives. I know that deep down, birthing a healthier relationship with Money and Power (daunting, big, scary words to my orphans) is so desperately overdue and so desperately needed in my journey, not just to parenthood, but to fully living. I like how Heather parses out the two lines not just of trouble but of action here: miseducation/education and parsimony/wealth. And as for money, oh money. Money and power and its misuses. That’s a doozy. Definitely something I’m going to be working on for a long time…. Thanks for the encouragement, all of you here, about how facing those issues on the inside of your house builds trust and connection within partnerships and families as they begin. Thank you for the blog post about money. The main issue I have been working on in side myself is the whole issue of what I value. My healing practice has been strongly impacted by the economy, so I have been left to process the true meaning of self-worth in spite of financial challenges. I can’t tell you how much your articulation of this issue validated my struggle around this cultural wounding we have about money and self-worth from within. Your post has rekindled my spirit’s desire to embrace fully what is truly valuable to me. I hope you continue to receive all of the support you desire for birthing your new projects into the world. Thank you for your voice Julia. After reading your post, a few thoughts come to mind 1) the need to continue to educate the world on the topic of fertility as there is so much more education that needs to be done and 2) our continued relationship with money. The episode of The View is my perfect mid-wife birthing a new area of focus and passion for me. I watched a few minutes of the show on their website and feel strongly about the need to help others see what possibilities lie within to bring about our future babies. Instead of stating a bunch of age related statistics, what if shows like the View (or Oprah) focused on the tools that you teach through the Ovum approach that lead women like me to conceive naturally at 39. I’d love to barge onto that stage with my bulging belly and tell my story about how your work has helped me get to where I am today. Regarding money, I believe that the more we make, the more we can give, and the bigger impact we can have on the world. By birthing a healthier relationship with money, we are able to open ourselves to the abundance that is out there for all of us. My husband is reading Think and Grow Rich by Napoleon Hill. Although I haven’t read the book, he talks about the fact that it was originally published in the early 1900’s and is still relevant today. In summary, the book states that the healthier our relationship towards money is, the more we find ourselves having it. It’s my visionary that keeps reminding me that by birthing my passion around continued fertility awareness while developing a healthy relationship with the money, I can personally create a better world that teaches women that their true power to create and conceive lies within. Thank you for your work and for helping me and hundreds of other women. This is truly worth all the money in the world. Thanks for a great post! And for reminding me that this entire journey is a holistic one in every way. That having a better relationship to money (like with food and other things we sometimes have to work on) brings me closer to my baby. I’ve spent some time thinking of how my relationship with money is linked to the way I perceive my “value”. I seem to always strive for just a bit of money… never aiming at something more. I am good at managing money, but never really believe I deserve much. Thank you so much for this blog and post. The money orphan is definitely part of my husband’s reality and both sides of our family have individuals dealing with extreme money issues. I so much appreciate you, Julia, that you are connected spiritually. I am so grateful for the alternative to deal with orphans that I never felt in the medical environment. How are you supposed to deal with bad news- mostly half-smile painfully in front of the professionals then go home and cry. I love that you deal with the emotional issues – and they are huge! This work is extremely valuable. This society is wanting medication for everything and often it is not the best choice. Thank you so much. I am also exceedingly grateful to all who are posting here. Thanks for another great and timely post. I know my relationship with money started out horrible as a young adult but has been improving as I get older. I am very aware I am not totally able to ask for the compensation I am due for my work but I am letting that idle on the back burner while I tend to some other orphans. I am sure tending to these orphans is ultimately helping those. I was awake a part of last night frustrated that we are doing IUI’s and we don’t really have a choice. My husband had a failed reverse vasectomy years ago so we have been using donor sperm. It worked relatively easily 3 1/2 years ago. This second time around has been much more of a challenge. When the IUI’s didn’t work as quickly as the first time and things in general seemed off I made the huge mistake of not listening to my husband and chilling out but jumped on the drug bandwagon. I was so used to hearing I was running out of time. I was only 38 and had just had a baby but all that stuff got me right where it needed to and I was hooked. I did finally get off the bandwagon and after a long break we started trying IUI’s again. So far no luck. I am actually 1 week late today and having symptoms but I have 2 negative home pregnancy tests so I am not optimistic. Instead I am convinced it is the progesterone they have me take. I have read it can cause a delay to your period and symptoms. I stopped taking it a few days ago. The good news it has gotten me questioning things and thinking why am I even taking this. I guess because I had heard of so many people taking progesterone. Its just supposed to be a boost. The problem for me is since I did so much work to get my cycle and everything back to it’s own natural flow the progesterone is throwing me off which I don’t like. I always feel nervous when I decide to tell the doctor what I think but he is always so ok with it. I am still open to taking it but I want to know I need it and maybe I don’t need as much. Also maybe I should have a blood test after 10 days and i its negative stop taking it. I have a good doctor but drugs are such a part of their thought process. Also that once things seemed so off or me a couple years ago how could they have gotten better especially now that I am 40. In one way I am grateful they have IUI and donor sperm because without it we would have little chance.I just have to remember that I am a big part of the process and not take anything they hand me. I did have a significant shift last week – it felt like if I were an onion a thin layer just peeled off. Mostly it was about coming to terms with things. I am blamed for something huge in my family that wasn’t my fault. I finally had the courage to ask my sister again if this was true and she confirmed it was. Although it was hard to hear it did allow the weight on my back to be more defined and my anger to become clearer and at times I felt lighter and more that although I do not know the path out of here I finally saw a crack in the wall holding me here. This week I worked with the mirror of truth exercise to make it clear the negative I carry around sub-conciously and start shifting it to the positive image I know I am. What a great posting, Julia. I did hear about The View episode and I’m glad I didn’t see it. I can only imagine what a disservice their negative position did to many women. It’s too bad that the Rancics are letting their “celebrity” be used to spread a less than optimistic message. When I started my fertility journey (before Fertile Heart) I absolutely wished we had the insurance coverage for IVF. But even without it, I was prepared to put all the expenses on a credit card because I was told this was my only option. But since I wasn’t a candidate due to high FSH I was able to educate and empower myself to choose my best options. Working with the fertile heart tools have revealed some money orphans for me. They keep asking me, “is this the best time to conceive?” and, “are you financially responsible enough to support a child?” By identifying these orphans I’m turning them into visionaries. As a result, my husband and I are trying to create an all-around healthier relationship with our finances. I know this conscious effort is a good way to create space for a child. Congratulations, Kristen. I really appreciated hearing your story. There are good days when I feel on track and very positive about my choices. But then there are those days when I question everything I’m doing. Your story was inspiring, thanks. Ahh Julia, once again a very timely post for me personally. I am nine months pregnant after practicing your work for over a year (phone circles, image work and attending two workshops). I have never done IVF and i must admit, if it were covered by insurance i probably would have jumped right into it, but divine intervention interceded and i found your work before i paid the money for IVF. I know IVF would not have worked for me, one reason being i felt it wouldnt work and i knew i had lots of inner work to do to bring me this baby. I struggle right now with money issues around quitting my job and being a stay at home mom so how appropriate that in my ninth month you would blog about money! My money thoughts are definatety ruled by the Orphan. I must get back to work on confronting these orphans immediatley. I just want to thank you again for this baby i am getting ready to bring into the world. Without your work, i would not be pregnant. And if i were pregnant by some other miracle, it would not be with this same sense of calmness and confidnece i now have found thanks to all the inner work we did together. I always believed in your work but would find myself ready to wander off and try other things to “get me pregnant”, but you kept me on the right path by always helping me to find that other orphan in me that needed to be heard. I lost my left tube due to a ruptured ectopic pregnancy and while i was home recovering i got out all the fertility books that i had never gotten around to reading before i finally became pregnant with the ectopic. I was convinced that i had some control over getting pregnant and poured over all the holistic books looking for the magic formula. When i was introduced to your work, i again tried to replicate what you did to become pregnant even though you kept telling me it wasnt your diet, it wasnt your trampoline jumping or your yoga poses that worked-it was the work you did on the inside that brought you your second child. I believed you and continued to practice the imagery work and to take a deep look inside (while practing yoga, jumping on the trampoline and following your diet:-)). Time would pass and i would get frustrated and start again to look at some sort of medical cure or reason for my infertility, but you always steered me back to myself. I will admit at times i doubted you, but you said that was okay too, just keep doing the work and i did. I knew i had lots of inner work to do and that it would only make me stronger in the end no matter what the outcome. After working with you for over a year, i remember you saying to me that it may be time for me to try taking a break from acupuncture and to use that time to do something else for myself. I had been going to acupuncture for 3 years (a few different acupuncturists) and that is really when things started to “click” for me. I realized i was faithfully going to this acupuncturist because i felt i had to-i was scared into it. It is written everywhere that acupuncture helps fertility right? But quitting for me became so liberating. I know it wasnt quitting the acupuncture that got me pregnant. It was finally believing that i could make more of a difference by doing simple and FREE things for myself like walking that made me feel better and stronger mentally and physically. There is so much truth to your statement that our society feels if it costs more it must be better. I often wondered if you charged more for your workshops would people feel the worshops were more successful? Would they feel more of an urgency to attend?? I guess on the other hand though, that is the one of the reasons i really trusted you and kept me believing in you-i knew you werent doing this for the money. When I found out i was pregnant i was shocked, but then again i wasnt shocked at all. I had finally reached a point where i felt comfortable with what i was doing and how i was feeling and for that i really cant thank you, your dedication and your work enough. start paying attention to things we wouldn’t pay attention to otherwise. It’s pretty awful that getting woman pregnant became such a business. When you know that people could get pregnant doing something a lot less invasive and you are still telling them that their best chances are with IVF, the money you make is tainted money. I can understand that there are some women who don’t have fallopian tubes or really need IVF for some other serious medical reason. But from what I can tell, a lot of the money made in the baby making business is tainted money. Julia thank you for having the decency and the guts to talk about this. You mentioned that book Everything Conceivable at the workshop, so I got it. I wish I had read it before my IVF’s. I might’ve done your workshop sooner. Thank you for this blog and for your dedication, Julia! Julia, thank you for your recent post! I attended your workshop last weekend as well. Thanks to your wonderful insights, words and experience, my eyes have been opened to possibility. I am now learning to recognize when my orphans are calling out to me. I’m learning the negative consequences of turning my power over to other “authorities” who I thought could give me a magic pill or do a magic procedure to make me pregnant. But I’m learning now to recognize the power, longing and will within myself….that every thought that enters my head and action I take can have a major impact on my holy human loaf. I know that this is a daily process that will unfold for me in the right time….some days will be more challenging than others. But thank you for helping me cast a new light on this fertility path….and opening doors. I look forward to your upcoming phone circles. I know this ovum work requires daily work and commitment — and thank you for this opportunity! Thnak you for another great post, Julia! It looks like our whole healthcare system is being hijacked by the Money Orphan! What a shame that medicine should be such a business in this country. I can definitely relate to feeling that making money is bad. I have a lot of friends who are artists. They make very little money but they also feel kind of superiour about it, like it’s a virtue to be poor. I love the whole idea of working with the money Orphan. Thanks for sharing Jamie’s letter, that’s a pretty amazing nod from the Ultimate Mom. By the way I’m not surprised by the View. I really don’t expect anything better from them, or from any of the other talk shows for that matter. I wish Oprah would have the sense to have you on the show. They did a show about infertility a few years ago, that was all about the biological clock. So it’s time for them to do something more empowering. I mean Oprah is into empowering women, isn’t she? Having seen this episode I am somewhat appalled by the contents. Not shockingly, of course, but it is so painful to hear an hour long, well-viewed show only devote itself to ONE possibility. They spoke only once of “alternative” options, and basically poo-pood acupuncture and anything else, and left it at that. That said, clearly it is a money game. I remember meeting you and being so convinced that clearly the path to hopefully having my baby did not mean spending $15K outright. I feel so strongly that money spent on fertility should be spent with knowledge, and it seems like so many couples are just spending because “someone told them to.” As you’ve told me, knowledge is power and how could these couples, including Giuliana and Bill Rancic, not try and find every single option? Instead, she got berated by the co-hosts for not gaining enough weight, hearing them say that surely THAT was her issue. As far as who is in charge of my finances, mine is most certainly the V. My visionary helps keep me on track and helps me to be clear about what is going on. I’d much prefer to never see my Money Orphan, though, of course, she pops her head out sometimes. The Visionary, for me, is what reminds me that there is NEVER enough money to try and get pregnant, and that it is all possible, no matter what–financially and otherwise.